Harper and Edelweiss gave me the opportunity to read this book for review (thank you). It will be published March 20th. Both cases are complex, it involves different tribes and the investigating officers sometime clash. 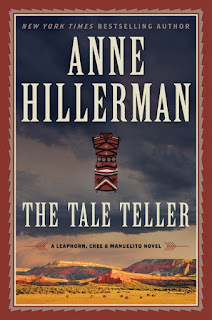 Ms. Hillerman talks about family relationships in this story and shows how their history as Indians has affected how they act. It all sounds authentic and it's interesting. They find the dead man was a thief. His girlfriend's uncle get shot. And it takes a real good detective to find the missing antiques. The cases are connected by not obviously. With more than one case, many different cops from different departments and a dog involved, it takes time to sort out the connections in the case and identify the killers. Leaphorn and his girlfriend have some problems so there's even domesticity in the cop's lives. I enjoy these characters. I began reading them while Anne's father was writing them and she's doing a very good job of carrying the characters forward. 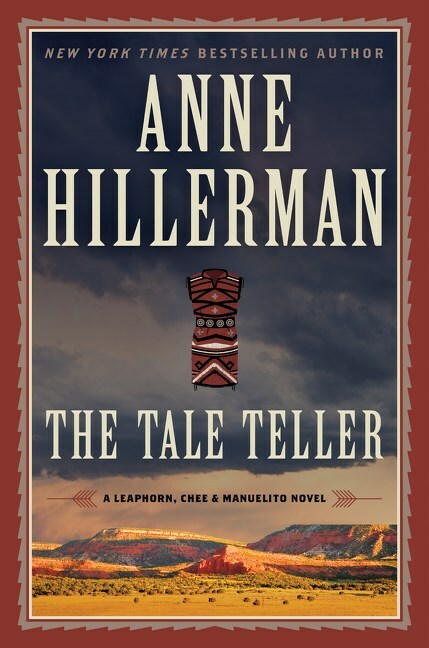 Thanks for taking time to read "The Tale Teller" and for your comments. I feel honored to continue the stories my Dad began so many years ago. I'm grateful that Dad's fans and new readers have embraced Bernadette Manuelito, my main crime solver, as an lead character and gone on this ride with me.